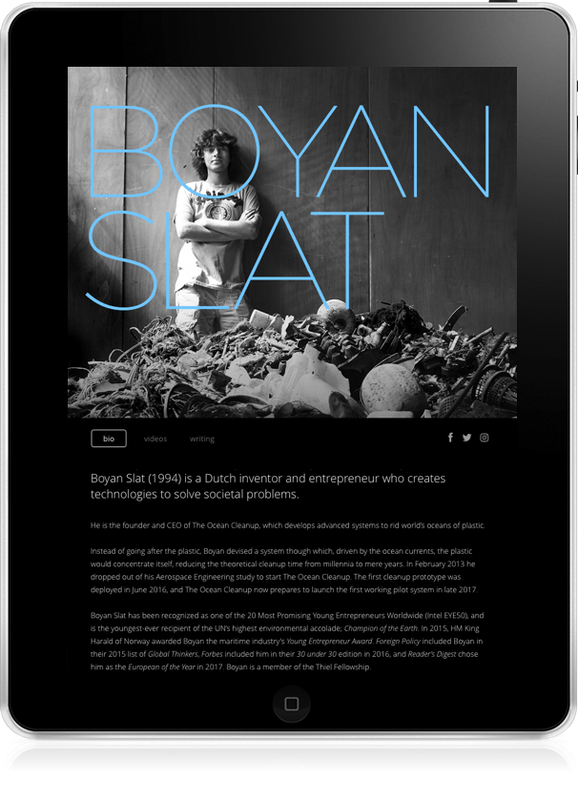 Boyan Slat is responsible for The Ocean Cleanup, an initiative to clean the world's oceans by 2020. A biographical site of the 19-year-old Dutch student positioned Slat as an environmental entrepreneur, capturing the essence of his vision and lead viewers to donate 2.2 million to the cause. Slat has been recognized as one of the 20 Most Promising Young Entrepreneurs Worldwide (Intel EYE50), by The New York Times, TED and is a laureate of the 2014 United Nations Champions for the Earth award. The responsive website build will continue to unfold as the Ocean Cleanup evolves.